image: A daylight scene of frantic dockside activity. 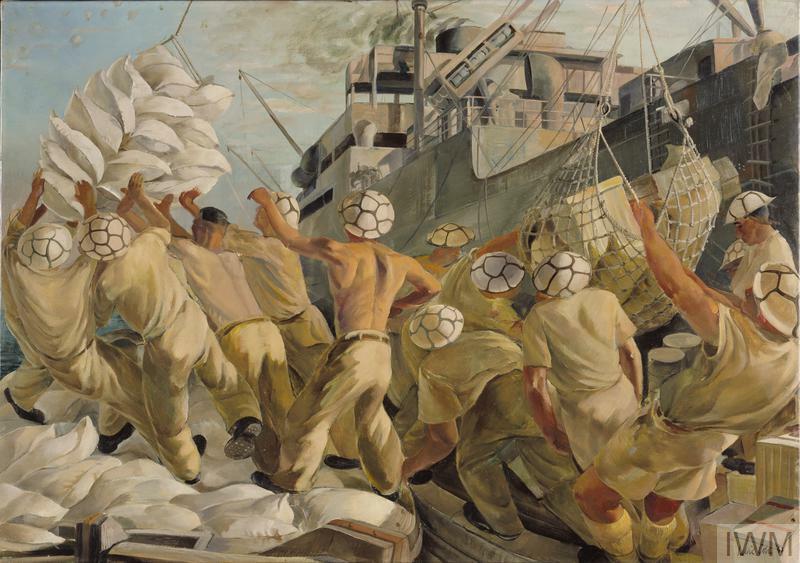 Helmeted dockworkers on the left take hold of a swinging load of white sacks being unloaded from the side of a merchant ship in the background. Several sacks are strewn around their feet. On the right another soldier hauls on a rope, guiding a loading net full of boxes down towards a second team of dockers. In the centre stands a figure, stripped to the waist, issuing orders. Puffs of smoke from anti-aircraft fire can be seen in the sky, upper left. Malta’s position mid-Mediterranean between North Africa and Italy made it vulnerable to attack. 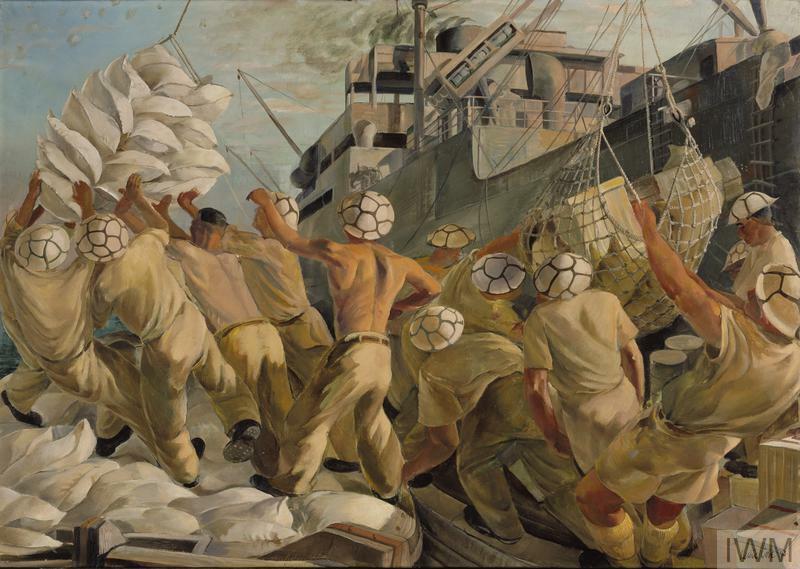 British efforts to re- supply Malta were at particular risk: during Operation Pedestal, a convoy bound for Malta from Gibraltar in August 1942, half the merchantmen were sunk by enemy attack. 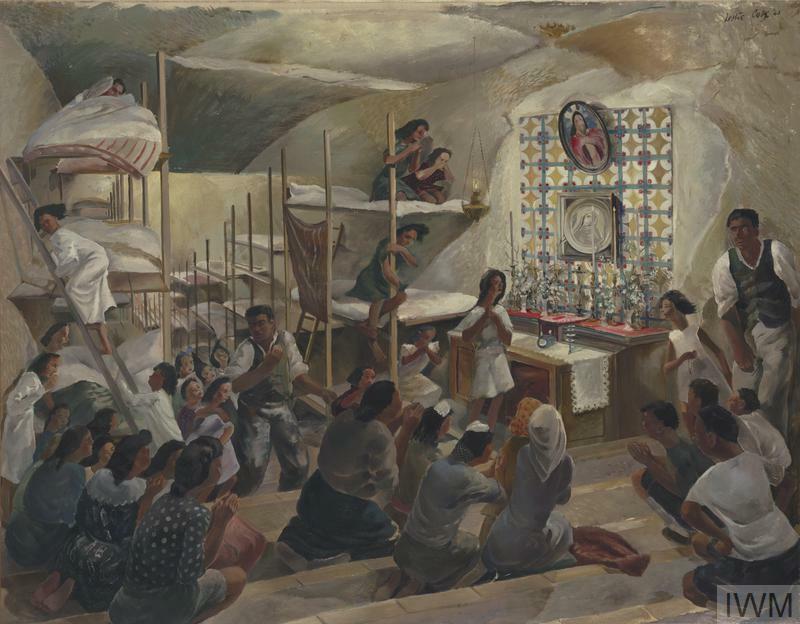 In 1943, when Leslie Cole visited Malta, the devastated island was still subject to air-raids and alerts as the Allied invasion of Sicily and the Italian mainland got underway. 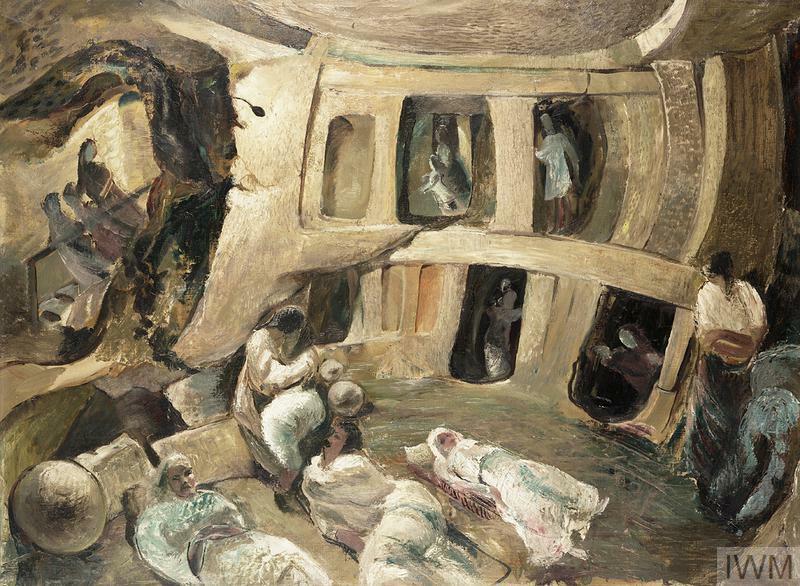 Some of Cole’s drawings in Malta show people sheltering from attack in underground shelters and running for cover. 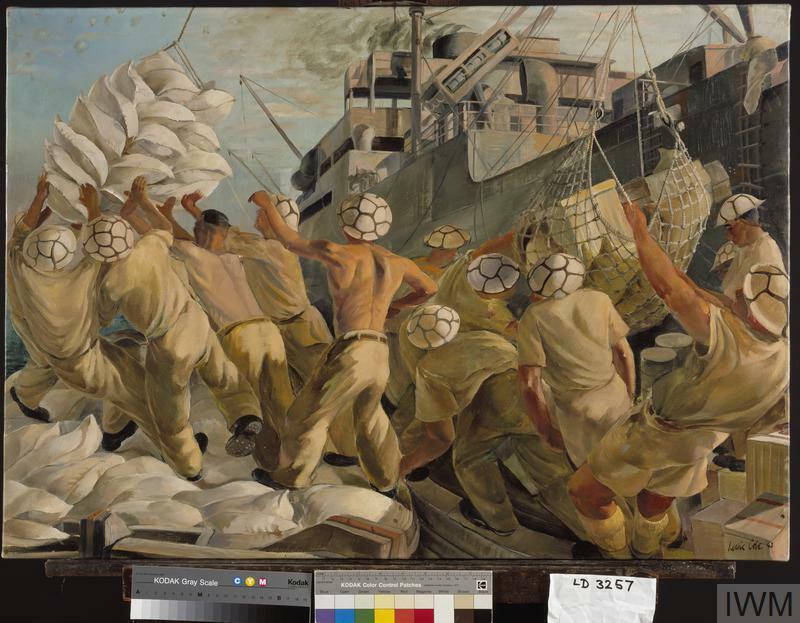 This painting of dock-workers has an urgency often found in his work, but the image has an almost theatrical air, with the central figure orchestrating the scene as if conducting a symphony. In this case the danger of the scene is subordinate to its mesmerising pattern, punctuated by the strange helmet-carapaces. During the late 1930s, the British government began to prepare the civilian population for war. 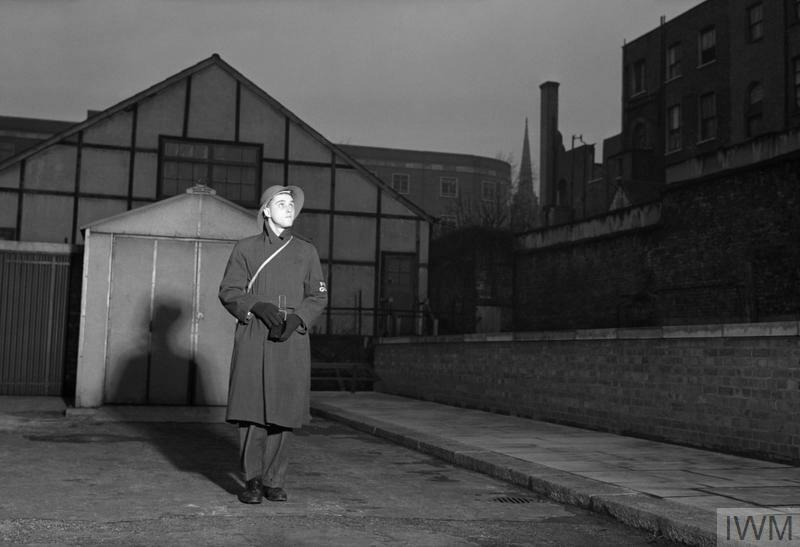 The Air Raid Wardens Service was set up in 1937. 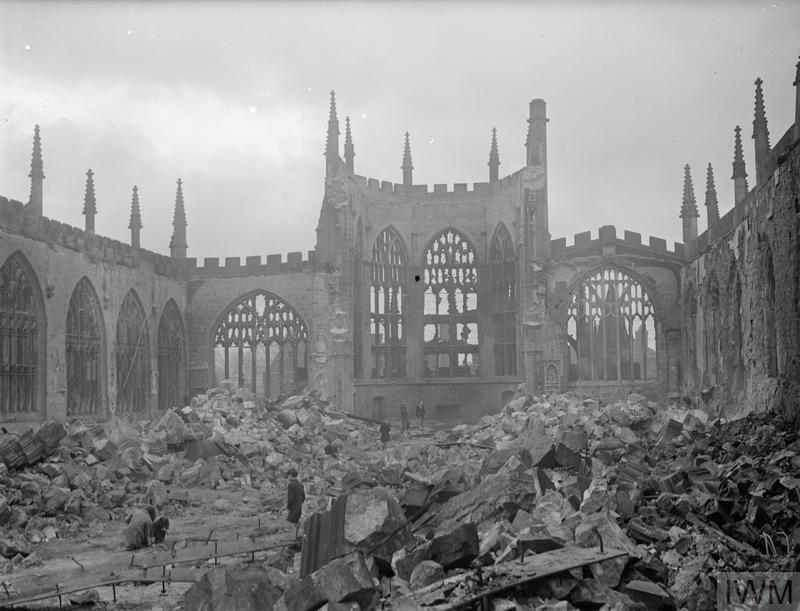 Wardens were responsible for reporting incidents, reassuring the public and providing Air Raid Precautions (ARP) advice. 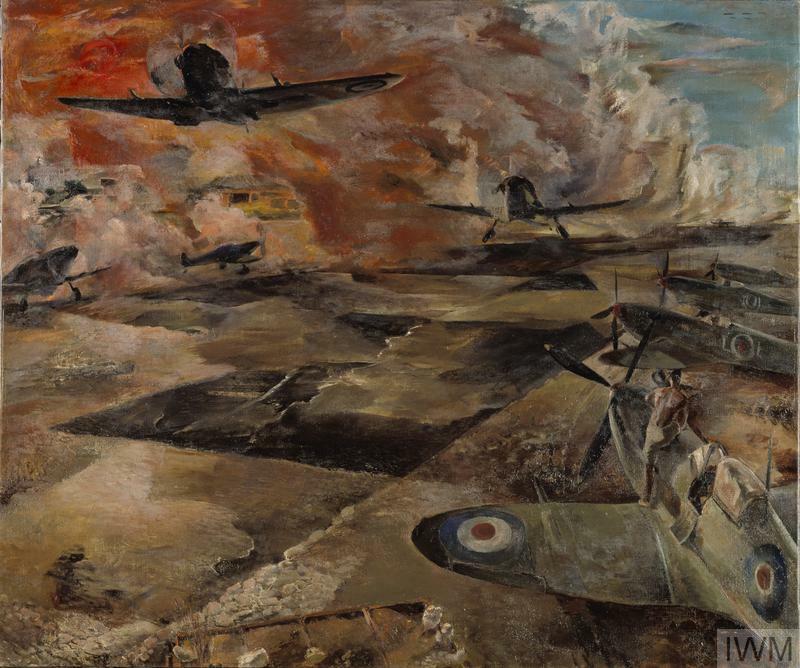 The 'Blitz' – from the German term Blitzkrieg ('lightning war') – was the sustained campaign of aerial bombing attacks on British towns and cities carried out by the Luftwaffe (German Air Force) from September 1940 until May 1941. 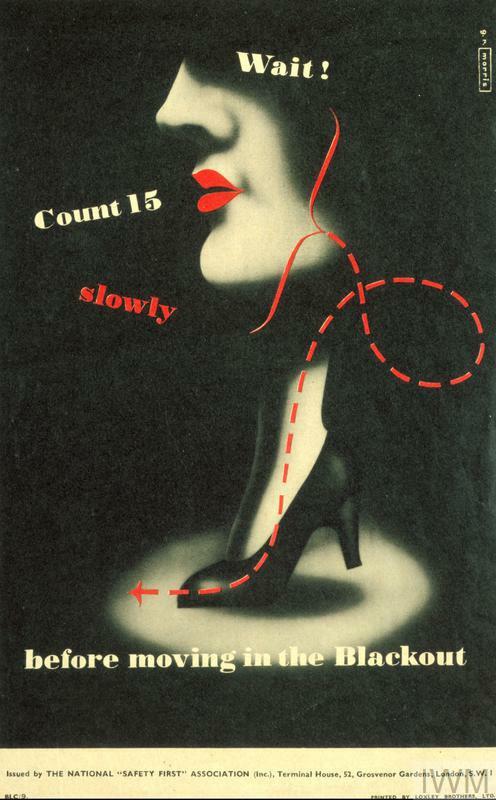 The National Health Service was introduced in 1948, giving free healthcare to all. The Family Allowance was established and secondary schools were available for all children over 11. However, there was still great austerity.